There are many possibilities for morphing shape and color with shape tweens. Adobe Flash CS6 does a great job of recalculating shapes during a tween, but sometimes you need to give it a little help, especially when two shapes have common features. Flash may overthink things and perform more shape morphing than it has to. In these cases, you can use shape hints — sets of matched markers that can tell Flash that two points on two different shapes are related. 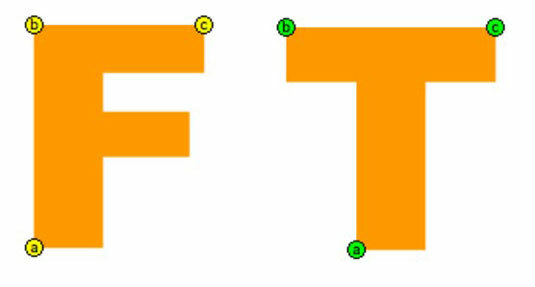 Two good examples of related shapes are the letters F and T. The two letters have many common angles. Creating a shape tween between the two is a great way to make use of shape hints. Even though the shape tween was successful, the outcome may not have been what you expected. Chances are good that the F seems to get mashed up (instead of completing a smooth transition) before being completely reconstructed into the T because Flash can’t see the common angles between the two shapes (even though you can). That’s where shape hints come in: You can add them to suggest common points to Flash and smooth out the tween. Select Frame 1 of your shape tween and choose View→Show Shape Hints to turn on shape hinting. Choose Modify→Shape→Add Shape Hint to create a new shape hint on the stage. A red button, labeled with the letter a, appears. Repeat Step 2 to add another shape hint. This time, the shape hint appears labeled with the letter b. Sometimes, shape hints stack on top of each other; move one to reveal the others underneath if only one is visible. 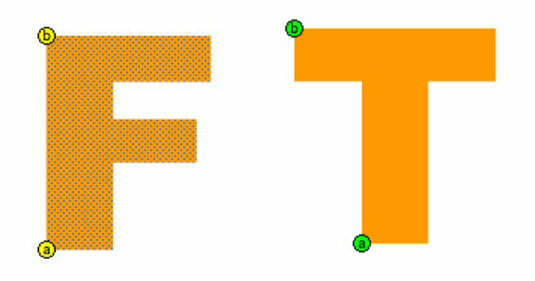 Position the two shape hints on the outline of the F.
To do so, move shape hint (b) over just a bit so that you can see shape hint (a). Then move (a) and snap it to the lower-left corner of the F. Position the second shape hint (b) in the upper-left corner of the F.
You see the companions to the shape hints you created, waiting to be positioned. Position shape hints (a) and (b). This step matches the lower left and upper-left corners of the T to the ones in F. The buttons turn green to indicate a successful match. If you can’t get the hints to snap perfectly to the edge (the hints will appear red), make sure snapping is enabled by choosing View→Snapping→Snap to Objects. If you watch carefully, you see that the shape hints are keeping those two corners anchored while the rest of the shape transforms, creating a smoother transition. Much like motion guides, shape hints do their work without appearing in your final, published movie. Select Frame 1 of your shape tween and make sure that shape hints are still visible by choosing View→Show Shape Hints. If they’re already enabled, you see a check mark. Create one new shape hint with the keyboard shortcut Shift+Ctrl+H (Windows) or Shift+Command+H (Mac). The shape hint is automatically labeled with the letter c.
Position the (c) shape hint on the F in the upper-right corner. Select Frame 20 and you see the companion to the new shape hint waiting to be placed. Position the shape hint on the T to match the angle you marked on the F.
Press Enter or Return to play your animation. You see that the shape hints have provided a much smoother transition from what you started with.